The holiday includes novel practices such as the "Airing of Grievances", in which each person tells everyone else all the ways they have disappointed him or her over the past year. Also, after the Festivus meal, the "Feats of Strength" are performed, involving wrestling the head of the household to the floor, with the holiday ending only if the head of the household is actually pinned. Those of us watching the news from the Summit of the Americas have been regaled with news story after news story on the weekend Festivus. Preliminary to this year's Festivus was President Obama's brief stop in Mexico. Pres. Obama carefully avoided pointing out that Mexico's decades, perhaps centuries' long corruption and disregard for the rule of law had much to do with the thriving drug cartels, and his administration stands by the "90% fallacy," which FactCheck.org and others have looked into and found lacking. There is consistent evidence that the drug cartels are purchasing weapons and military-grade armaments from Central America and the international weapons trade; ignoring this will not improve the drug wars. Additionally, the US has served as the pressure valve for Mexico, since millions of Mexicans who want to live and work in peace move here. Little, if any, credit was given to the US for that during Pres. Obama's visit. The Festivus, however, didn't get rolling until Pres. Obama arrived in Trinidad. There was a slight difference from the classical Festivus: the airing of grievances went only in one direction. First Pres. Obama walked across a hotel meeting room to meet Hugo Chavez, who just last month was calling the US a "genocidal, murderous empire" and was telling Obama to go wash his rear end. Chavez, who is cracking down on his political opposition at home and callls for the end of the American "empire" abroad every chance he gets, told Pres. Obama, "I want to be your friend," while government-owned Venezuelan media immediately spread the photos of the handshake. "I'm very grateful that President Ortega did not blame me for things that happened when I was 3 months old." No Festivus is complete without a gift, and what better gift than the old classic, Las venas abiertas de América Latina, by Uruguayan Marxist writer Eduardo Galeano, which blames everything that has gone wrong in Latin America for the past 500 years on Europe, and - you guessed it - the United States. 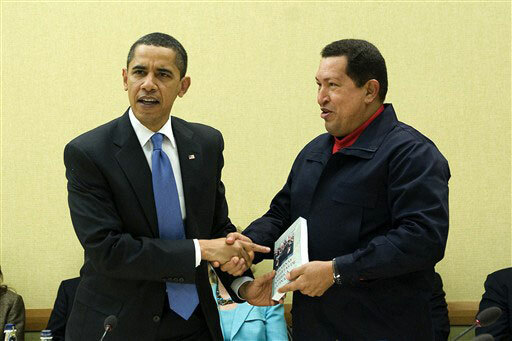 Chavez presented the gift to Obama, unwrapped and in the Spanish edition, since after all, what better way to make the point of how Qué ignorante eres, than to give the book in the original language. Having pinned the head of state to the ground, the rest of the Summit coasted right along. Indeed, a Festivus festivity like no other.